ASP-LS-D-R Annual Service Package Renewal for D2000 & DH2000s, 1 yr.
ASP-LS-HL Annual Service Package for HL series, 1 year warnty extn. ASP-LS-HPX Annual Service Package for HPX series, 1 yr. warnty extn. ASP-LS-LS Annual Service Package for LS series, 1 yr. warnty extn. ECOVIS-INSERT Spare chromium-plated, multifunction insert for ecoVis light source. ECOVIS-PS3.5 PS for ECOVIS. Regulated 3,5 VDC Power Supply, Output: 3,5V DC, 1100 mA, Input: 100-240V AC, 47-63Hz, 150 mA. EDU-SPEC-B-APP Print version "Applications in Spectroscopy"
EDU-SPEC-B-S-AP Print version "Applications in Spectroscopy"
EDU-SPEC-D-S-AP Online version of "Applications in Spectroscopy"
FIA-AIM-3200 AIM-3200 120+ position XYZ random access sample changer. Includes wash station and wash two channel pump. FIA-SMA-WIN Windows replacement kit - includes two UV/VIS replacement windows and six Teflon seals. FIA-SMFC Sandwich Membrane Flow Cell, for use with any FIAlab solution handling system. FIA-USP-100 Flowcell Ultra 100um pathlength w/fittings, tube,.03ml vol. FIA-USP-1000 Flowcell Ultra 1000um pathlength w/fittings,tube,.30ml vol. FIA-USP-200 Flowcell Ultra 200um pathlength w/fittings,tube,.06ml vol. FIA-USP-2000 Flowcell Ultra 2000um pathlength w/fittings,tube,.30ml vol. FIA-USP-500 Flowcell Ultra 500um pathlength w/fittings, tube,.15ml vol. FOXY-OR125-G Oxygen Sensor, 1000-micron fiber in 1/8" OD SS grooved ferr. 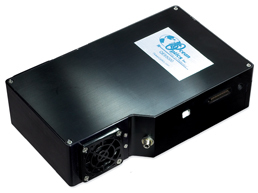 MPM-2000-UV-VIS400-1X16 Optical Multiplexer, 1x input 16x Output Channels, RS-232 controlled, 24VDC. Example program and driver included. MPM-2000-UV-VIS400-2X8 Optical Multiplexer, 2x input 8x Output Channels, RS-232 controlled, 24VDC. Example program and driver included. MPM-2000-UV-VIS600-2X8 Optical Multiplexer, 2x input 8x Output Channels, 600μ Fiber, RS-232 controlled, 24VDC. Example program and driver included. MPM-2000-VIS400-1X16 Optical Multiplexer, 1x input 16x Output Channels, RS-232 controlled, 24VDC. Example program and driver included. MPM-2000-VIS400-2X8 Optical Multiplexer, 2x input 8x Output Channels, RS-232 controlled, 24VDC. Example program and driver included. MPM-2000-VIS600-1X16 Optical Multiplexer, 1x input 16x Output Channels, 600μ Fiber, RS-232 controlled, 24VDC. Example program and driver included. P300-1.5-UV-90 300um Fiber, Al-coated, UV, 1.5 m, SMA to 90 deg. PRO-OIC-3-4 Optical Interface Coupler - 3/4"
PRO-OIC-3-8 3030-00-000Optical Interface Coupler - 3/8"
RAM-RSIQ-CFR Add-on module for RSIQ software supporting compliance with 21 CFR Part 11 "Electronic Records and Signatures"
SPECTROCLIP-JAZ-TR transmission and reflectance characterization of diffuse (thin) samples in the field. Combined with a Jaz spectrometer (400-1000 nm), 2 spectrometer channels, a tungsten halogen light source and battery module. SPECTROCLIP-R includes one integrating sphere to collected reflected light from your sample. SPECTROCLIP-TR includes two integrating spheres that collect both transmitted light through your sample and reflected light from the sample. USB-DT-B Spare/replace bulb - USB-DT "In House Install Only"
VENTANA-532-RAMAN-KIT Fully integrated Raman system includes 532 nm laser and safety glasses; FC-terminated probe and sample holder; and operating software. 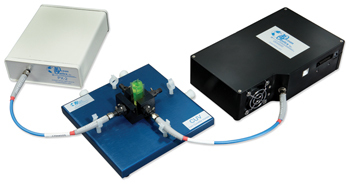 VENTANA-785-RAMAN-KIT Fully integrated Raman system includes 785 nm laser and safety glasses; FC-terminated probe and multipurpose sample holder; and operating software.